Sriracha is a very popular hot sauce that is not only fantastic as a topping but also as a cooking ingredient. I personally love to smoother meats and vegetables with it before roasting or sautéing them. The spicy, sweet, and garlicky flavours of sriracha pair so great with many things so most times then not it is a cooking success. 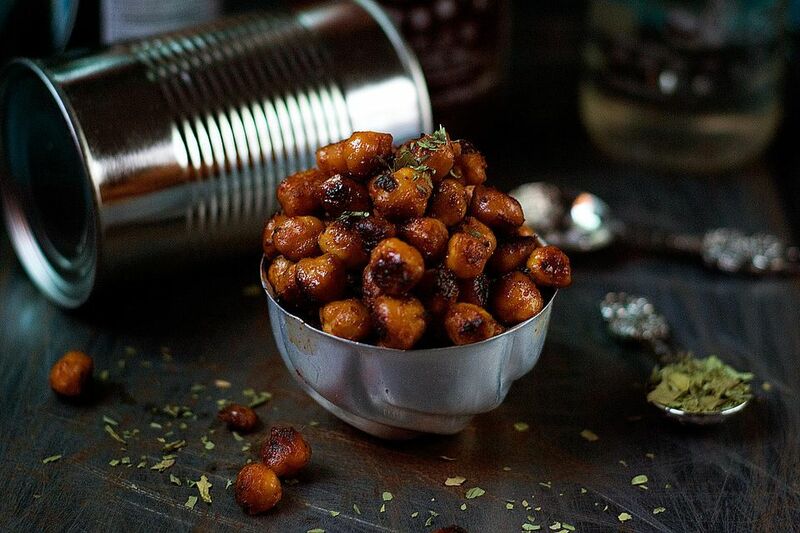 These sriracha spiced chickpeas are so delicious that you won't be able to stop eating them. Cooking them requires very little effort for the punch of flavours that they pack. You can eat them as a spicy snack or use them as a topping on salads, rice bowls, noodles, or really anything you'd like. The cooking time below will yield chickpeas that are slightly crispy on the outside and still tender on the inside. But if you want more crunch to the chickpeas you can cook them longer until they have the texture you want. You'll notice that the recipe calls for epazote leaves, this is optional. These leaves are a pungent smelling herb from Mexico but it can be an acquired taste. It does lend a great herby taste but if you leave it out the chickpeas will still taste great. You can look for the epazote at your local Mexican food isle or online stores like this one and this one. Open the can of chickpeas and drain them, then thoroughly rinse and set aside for a minute. Heat the oil in a non-stick pan and once hot add the chickpeas. Give them a good stir to try to coat them in the coconut oil. Pour the soy sauce and the sriracha over the chickpeas, then sprinkle in the epazote if using. Use your spoon to mix and help distribute the soy sauce, sriracha, and epazote over the chickpeas. Turn heat to medium and sauté until the liquid is absorbed–make sure to stir often to prevent burning. Lastly, taste and if needed add more sriracha hot sauce. Once the chickpeas are a bit caramelized (or begin slightly brown), they are ready. Serve as a spicy snack or on top of salads or your favorite foods.